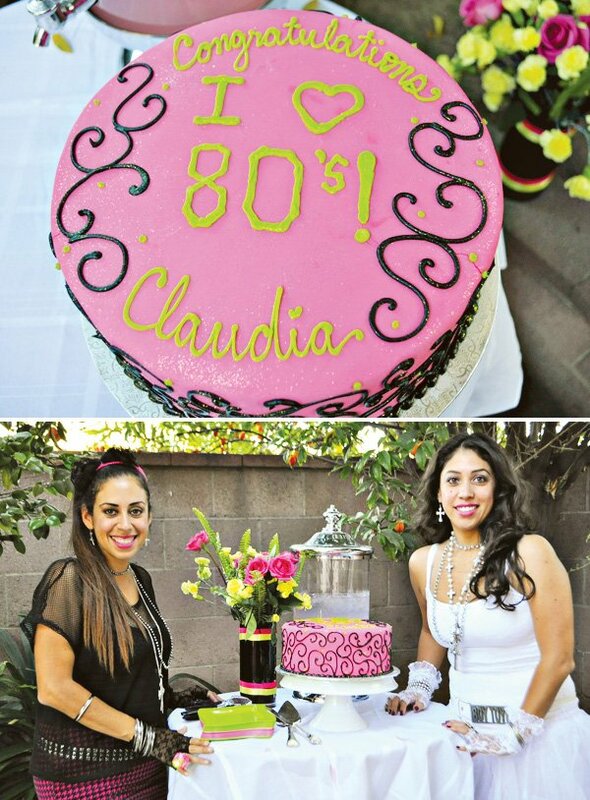 I was recently contacted to help create a 1980’s themed bridal shower for a good friend of mine, Claudia. 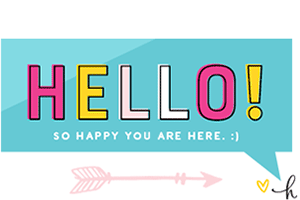 I started with the design of the invitation, which helped set the tone for the party. I thought a simple way to go without getting too cheesy, since it was still a bridal shower, was to have a “Madonna style” throughout. 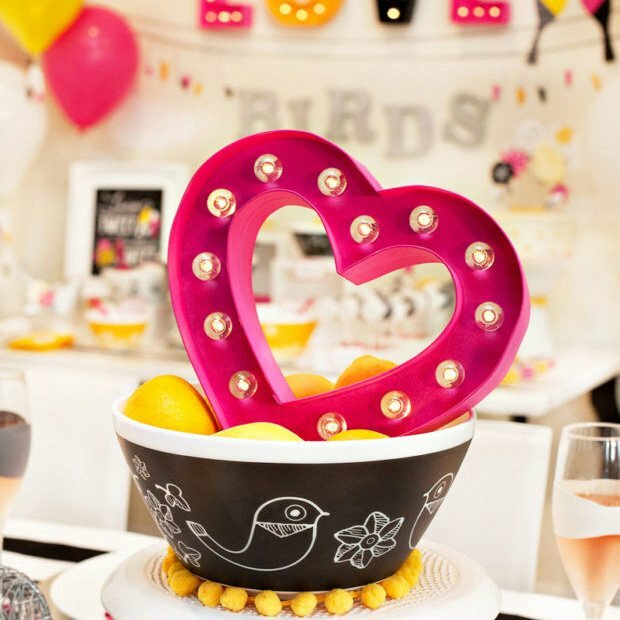 Using tons of black lace ribbon, accessories and neon colors helped to achieve just that. Everyone came dressed in their best 80’s gear, which made for a very fun day! The bride-to-be was also given an 80’s outfit to wear once she arrived and she looked amazing! 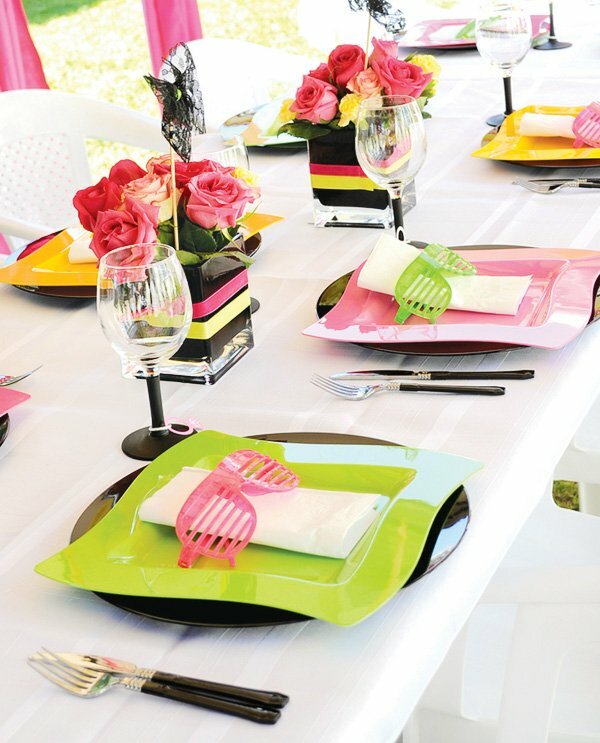 For the centerpieces, I used black cubed vases with neon ribbon wrapped around them and bright colored flowers. 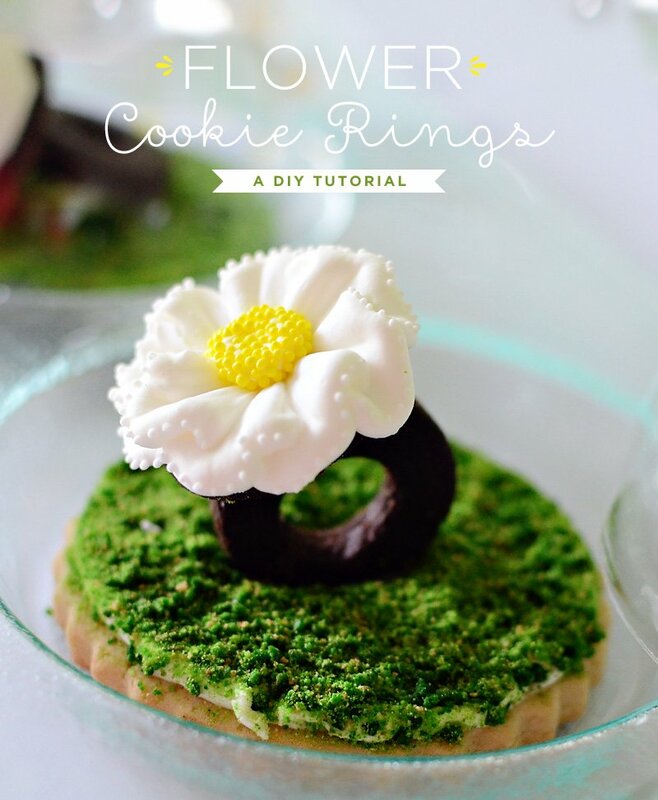 Each centerpiece was topped with a black lacy bow, to give it a little extra flair. 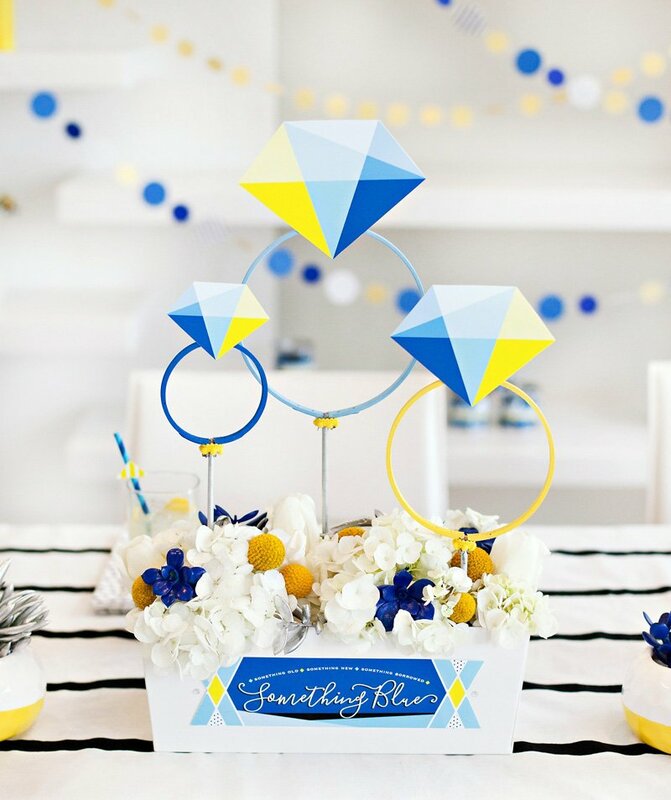 The place settings consisted of black chargers with bright color curvy plates and a fun pair of sunglasses to serve as napkin rings. I added ring drink charms to the wine glasses. 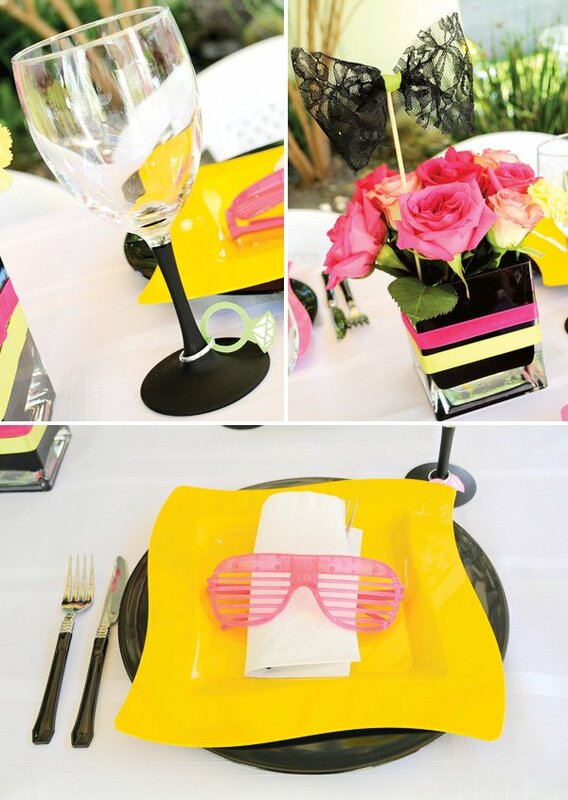 The stems of the glasses were spray painted with chalkboard paint by the bride’s sister, Vanessa. 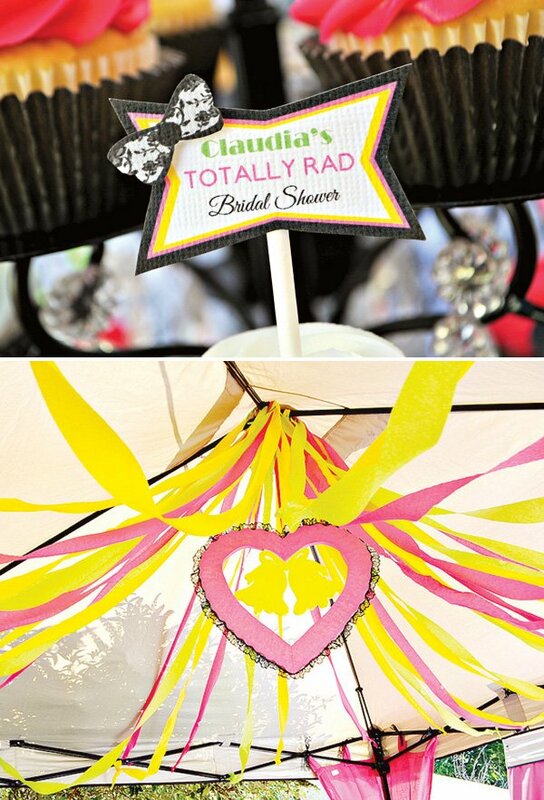 The canopies were lined with crepe streamers, with a styrofoam heart and bells (which was painted neon pink and yellow, then lined with black lace)! 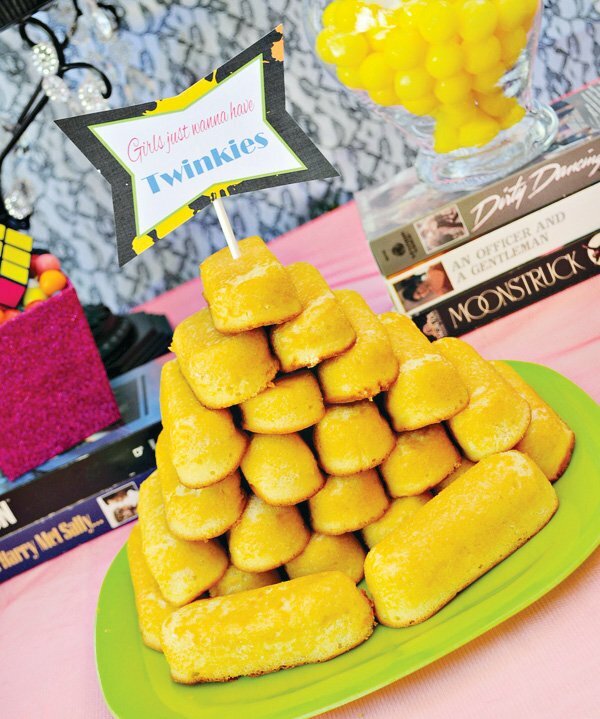 We used photo props by Paper & Cake as well. 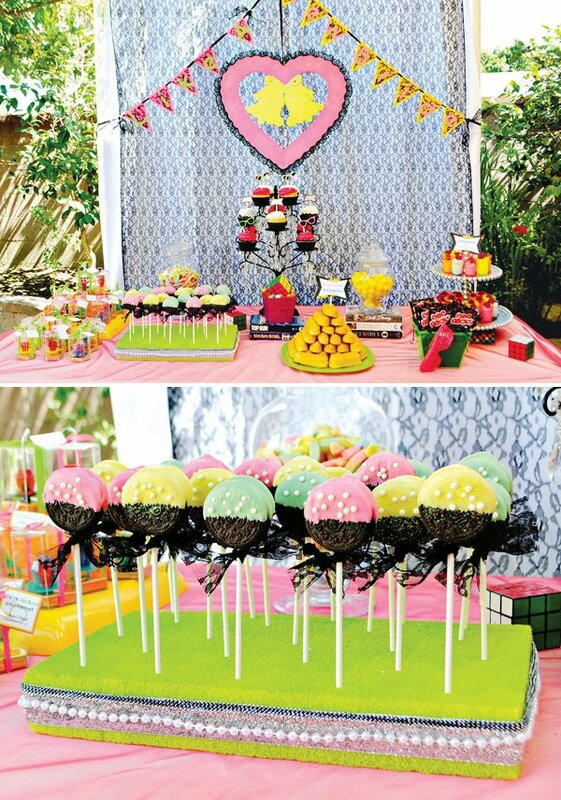 For the dessert table, I used black lace fabric for the back drop, a styrofoam heart and a banner I made, also with lined with black lace. I dipped oreo cookie pops and sprinkled them with sugar pearls, then wrapped each one with black lace ribbon. I also purchased some great love story movies on VHS tapes to use as dessert pedestals. 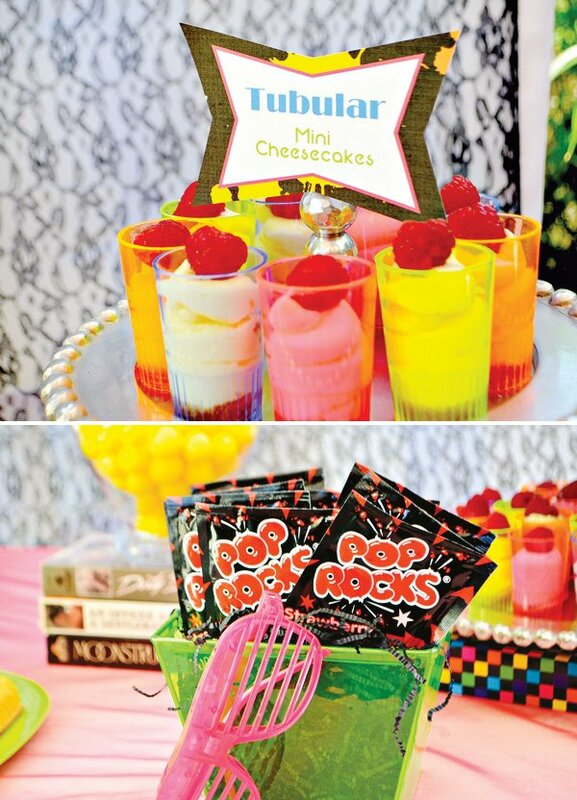 Of course, there were Twinkies and Pop Rocks. 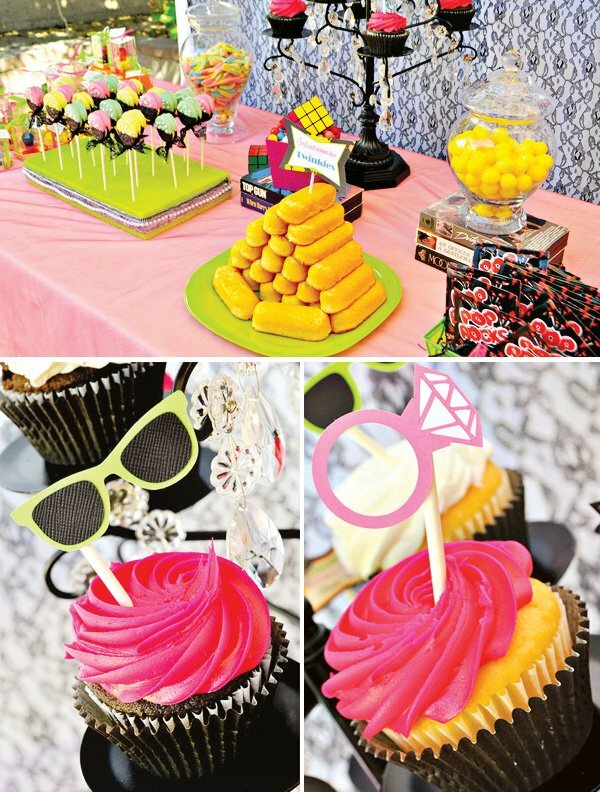 The cupcakes were adorned with toppers that I made, including neon sunglasses and neon rings. 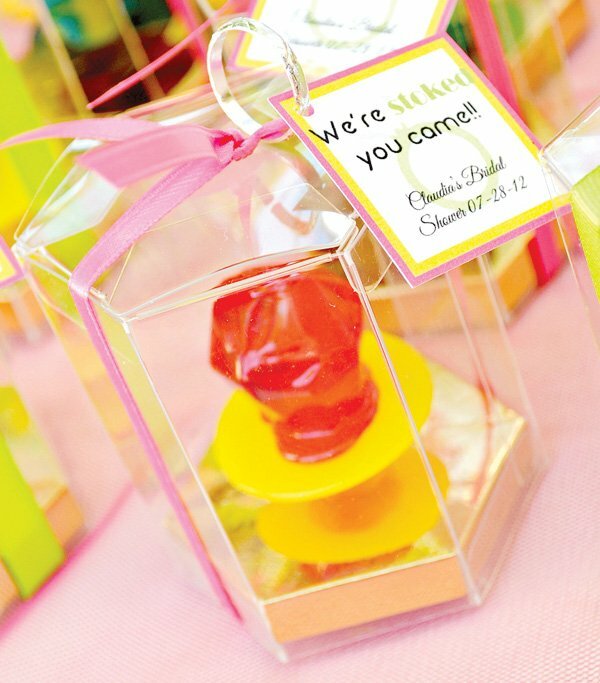 For favors, we used clear octagon shaped boxes and placed a ring pop in each one. I wrapped them in ribbon and added a favor tag. Love this. 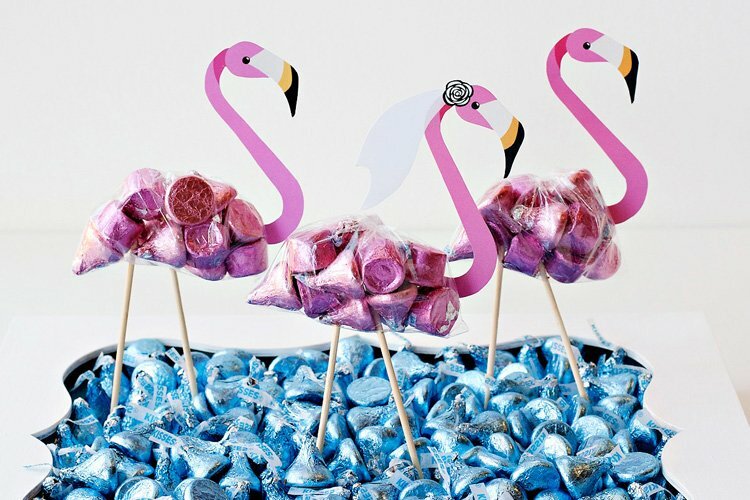 Looks like a Bridal Shower full of fun! Jeannette killed this theme! 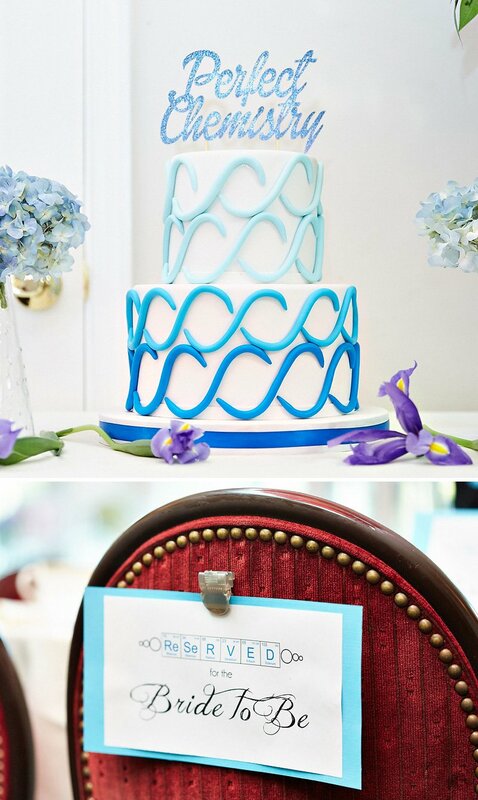 The addition of the black lace is what really put the theme over the top! Love. It. So creative! I LOVE this party! Great job Jeanette!